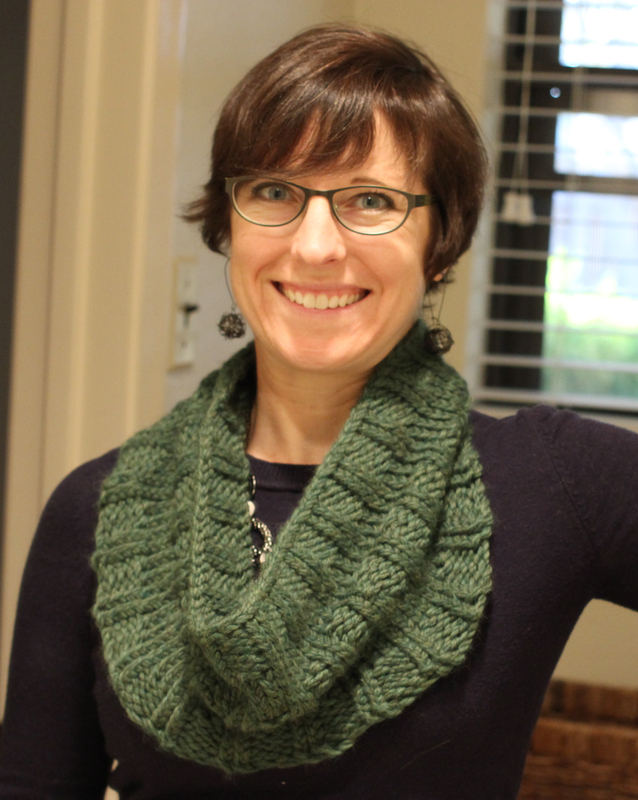 I recently finished off two quick projects, one as a Christmas gift and one for myself. 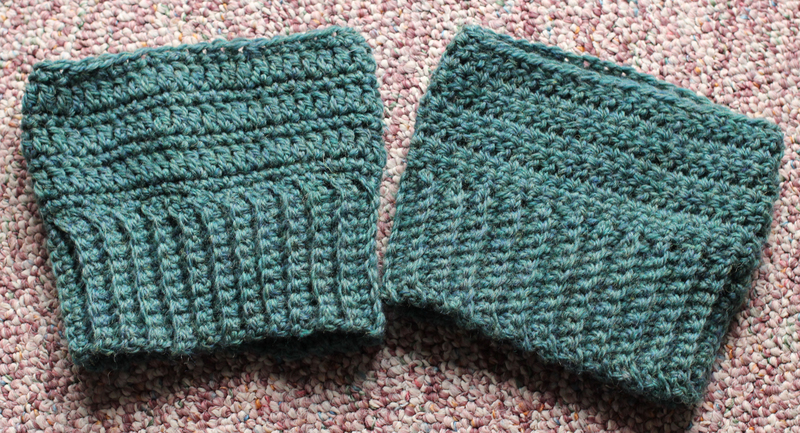 For my sister, I crocheted a set of boot cuffs after I attempted to buy her some last year on Etsy, a transaction that fell through. 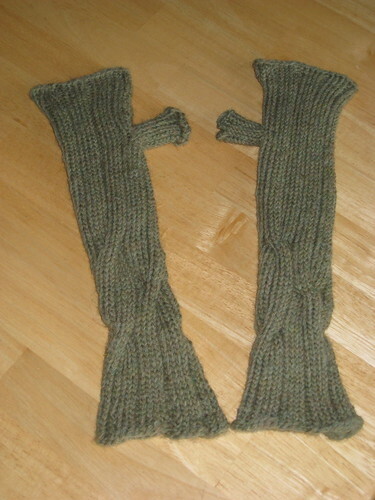 I found the boot cuff pattern on Ravelry. It was easy, just single and double crochet. 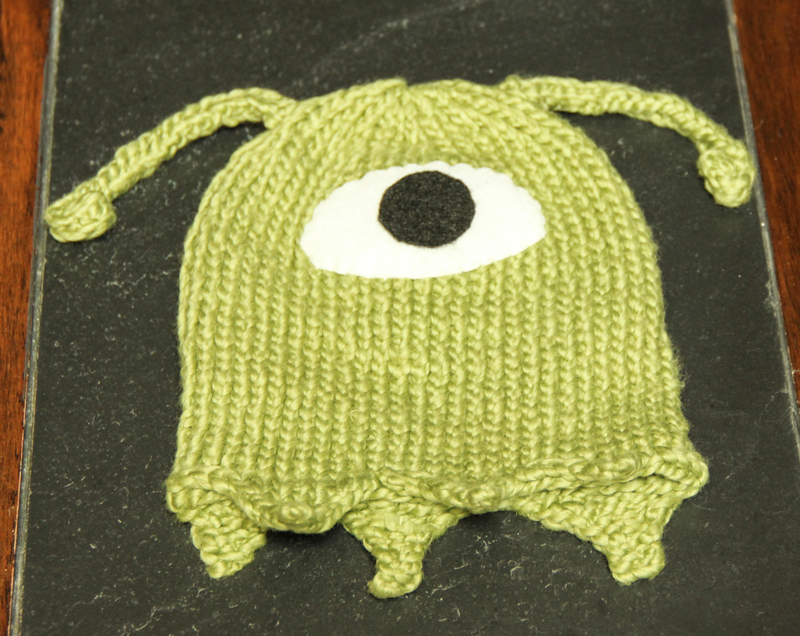 I found a teal wool yarn to use, since that was close to the color I originally tried to order for her. 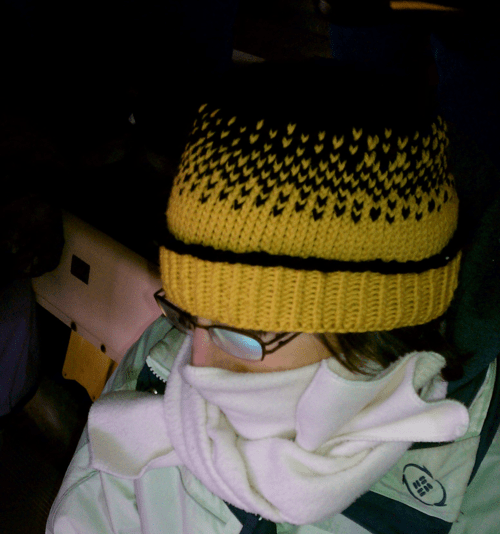 The second project was a neck cowl for myself. 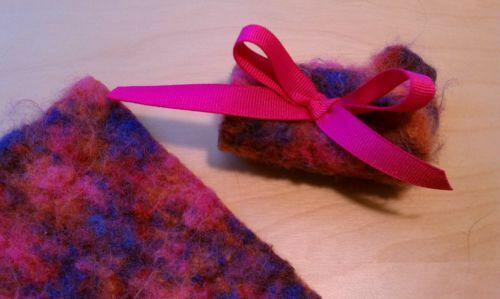 I get really excited about wearing scarves in the winter so I decided to make yet another one for myself. 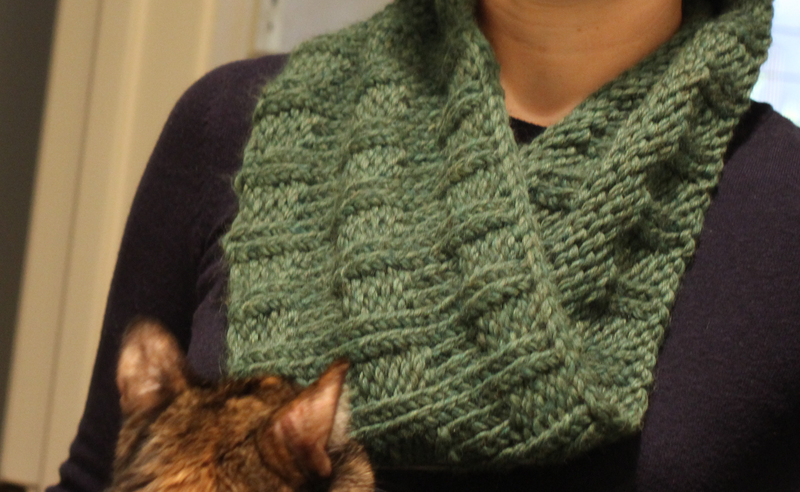 I found the pattern on Ravelry again. 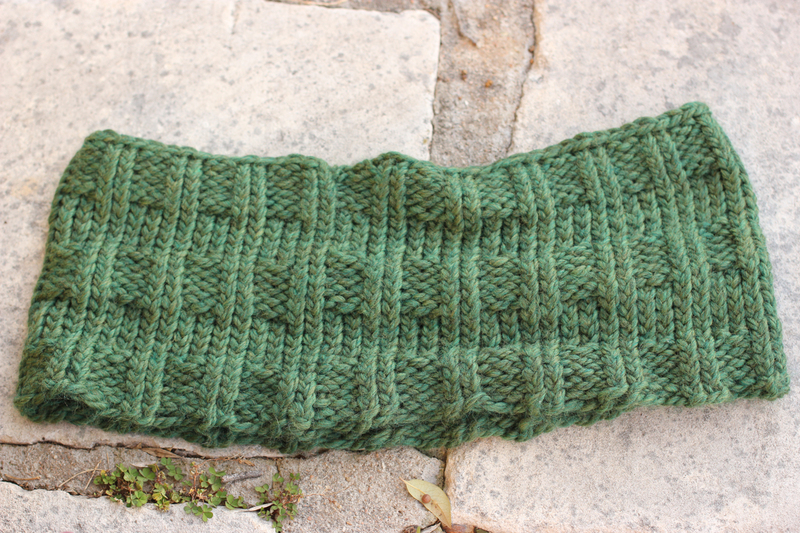 I ordered Forest Heather Biggo yarn from Knit Picks. 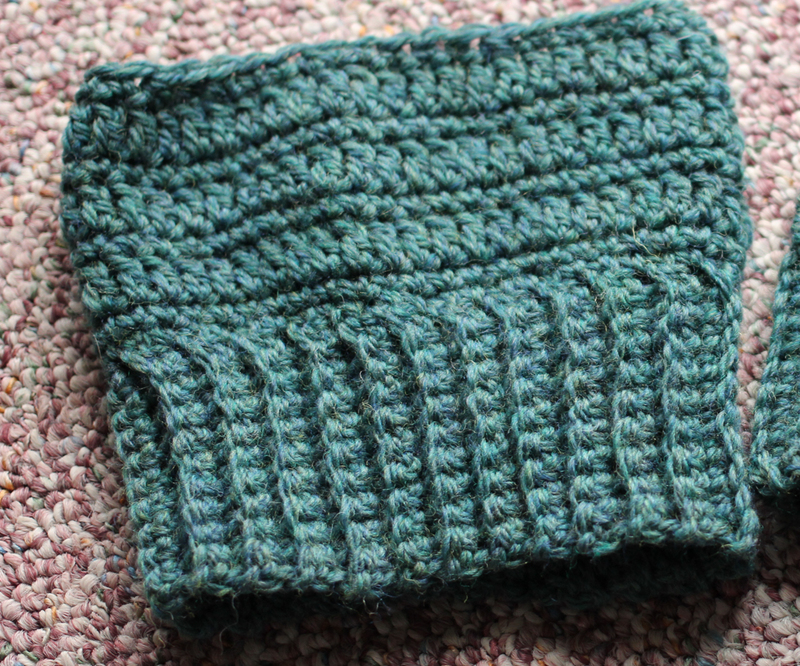 The yarn is very thick, and the pattern calls for large needles, so it was a project that went fast also. 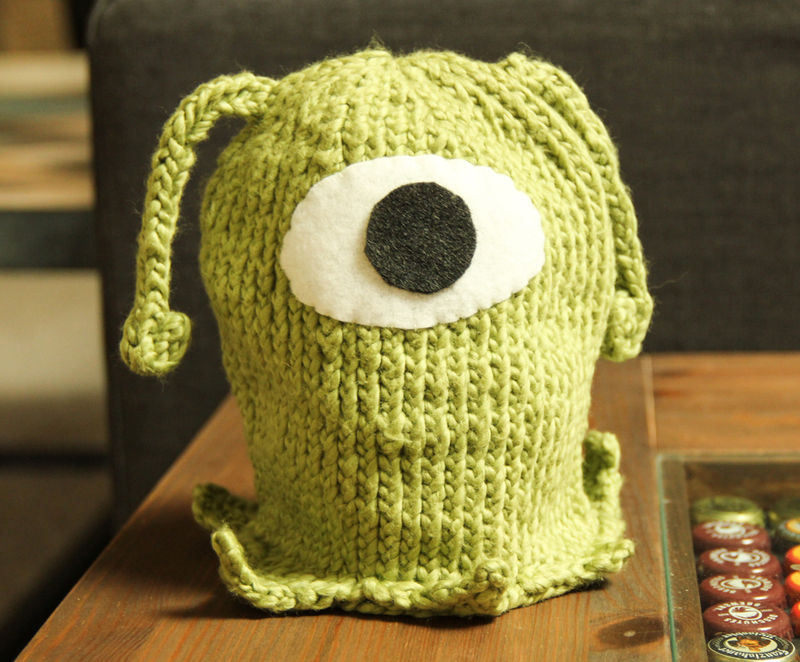 The yarn is pleasingly soft. My cat Annie decided to get in on the photo action. I learned how to take my own photo in the mirror. If you’ve followed me on tumblr, you know that 1. I have lots of friends having babies and 2. 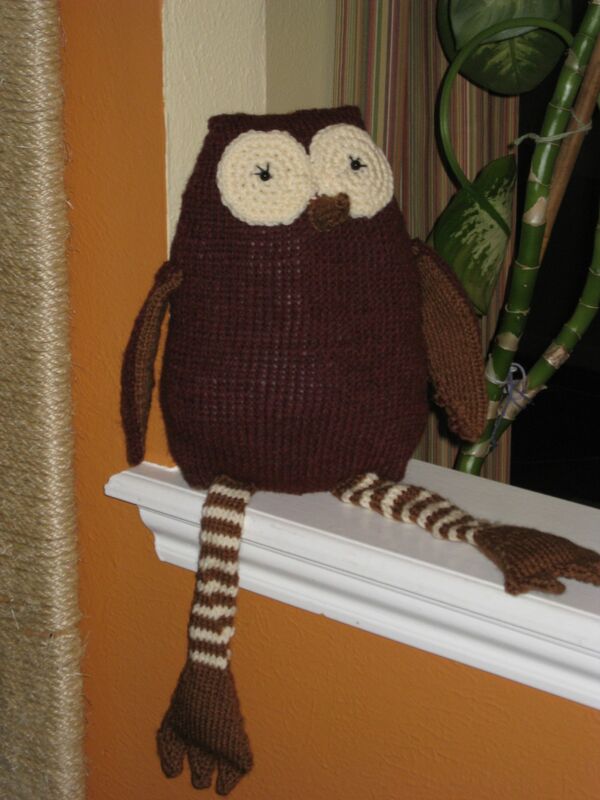 I started knitting an owl. Well guess what, he’s finished! Well, at least owl number one is finished. 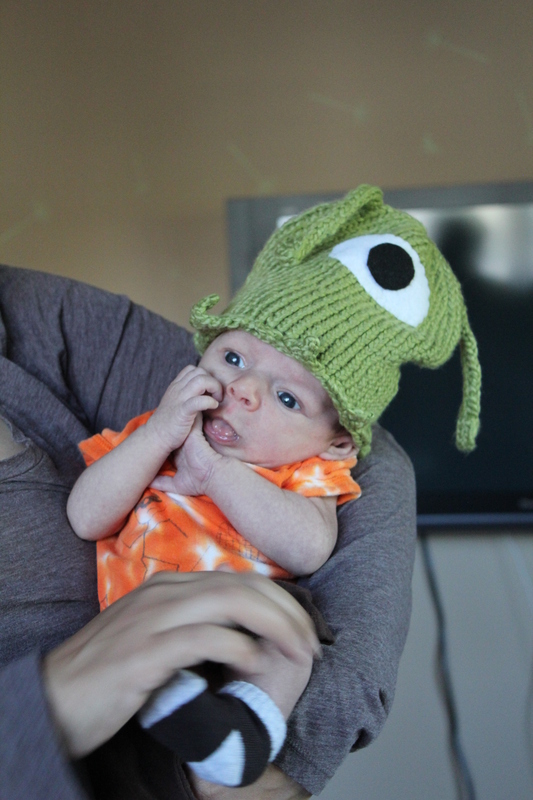 I have two friends that only sort of know each other and they had their first round of children within a few months of one another and now it has also happened for child round number two. The jogless stripes method doesn’t work that well for skinny little legs. It just makes the joints between colors constantly move. Next time I will just leave the color joints on the side of the leg so they aren’t so noticeable. If you use this method on a hat with thicker stripes, it’s much better. 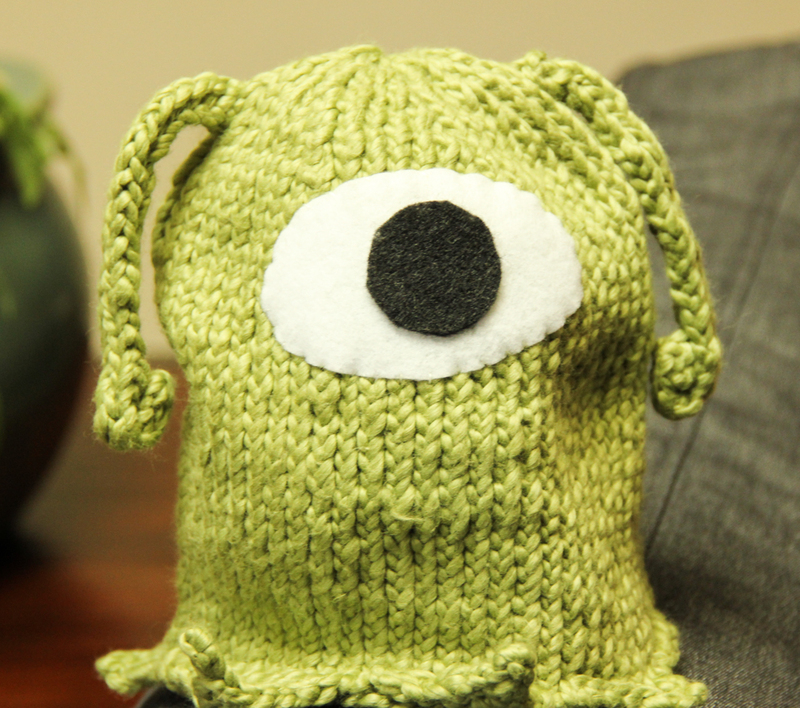 I’m really bad at sewing eyes and wings on so that they are level with one another. Somehow the owl turned out way too big. In the pattern photos he’s way smaller. I’m subtracting rows from the body and legs of the second owl I’m working on. 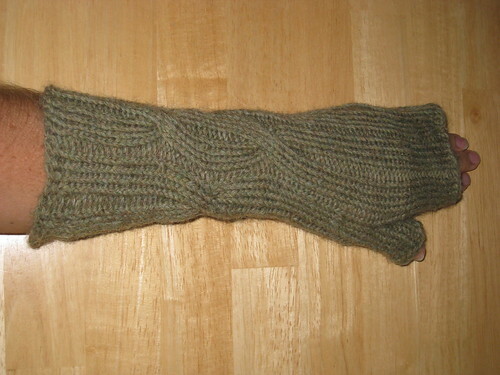 I learned and implemented intarsia knitting. How to do a picot crochet edge (for the wings) is a skill I now have. Even when they don’t quite turn out like you expect, owls are still super cute. 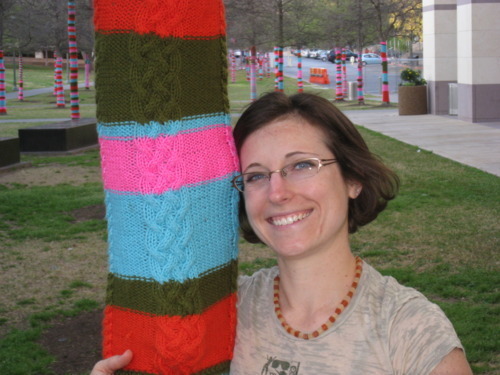 Making a bike trip to see the knitted trees! It is 5 pm on a Friday. I grab my bike leaning against my cubicle wall, strap my purse to the rack, throw on my helmet and roll up my pants. I am ready to ride. Down one flight of stairs and out the front door. Through the parking lot and gate, under Mopac and into the Domain. I watch the shoppers cross the street with their packages as I ride by. South on Kramer, I see a few folks waiting for the MetroRail to head downtown using the special weekend extended service. Metric, Parkfield, and across 183. The weather is gorgeous and the drivers friendly. I follow the confusing bike route that gets me across Anderson Lane without getting lost this time. On to Woodrow, a wonderful route to ride. Woodrow is an eclectic mix of Austin, all on one wide road with a nice bike lane. Small old houses meticulously cared for. Larger houses that aren’t. Big, modern houses with every environmental friendly upgrade imaginable belonging to Austin’s rich nestled between. Lovely xeriscaped yards, my favorite. The house with the chicken coop that we visited last year during the Funky Chicken Coop Tour (Try it sometime!). Riding Woodrow has almost too much to gawk at and I find myself not watching the road as closely as I should. I turn left on North Loop and ride past the vintage stores. Some random little band plays out in front of the shopping plaza. It is SXSW after all. The turn on to Duval always surprises me. The trees cover the bike route and street sign but I remember this obstacle and find the turn. Duval has a nice smooth bike lane, old houses, and large trees that make for a peaceful ride. I make the turn by Posse East and smell the French fries. On to San Jacinto and its smooth thoroughfare. It’s spring break so only a few students are on campus. A lonely maintenance worker drives a golf cart. On to MLK and the Blanton Museum of Art. 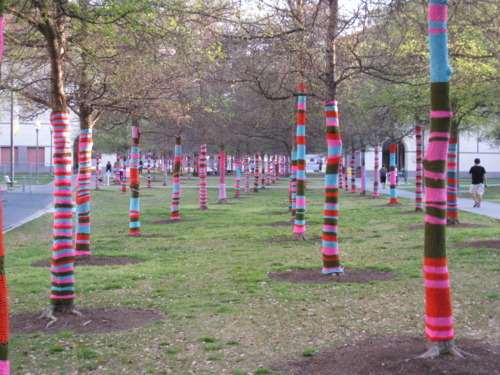 I am attracted there by the “Knitted Wonderland” exhibit where the trees have knitted cozies on their trunks. 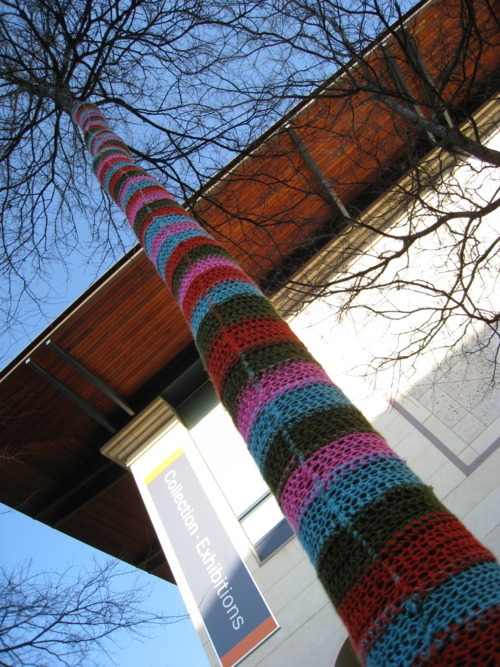 Being a knitter myself, I’m awed by the encompassing exhibit and the sheer number of tree trunks covered. I get in the way of a group of skateboarders in the plaza while looking for my husband. They’re polite though and I don’t realize I’m in their way until I leave. We wander around in the trees snapping photographs and then head further south for some SXSW action. Riding into central Austin during the spring just can’t be beat. Author’s note: this was also posted to Austin on Two Wheels.